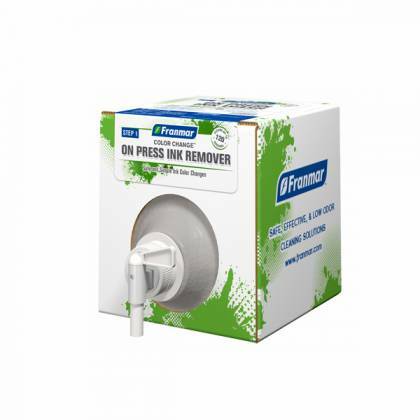 Justrite Safety Plunger Cans Help Safely Moisten Cleaning Cloths Or Swabs Without Spilling Flammable Or Volatile Liquids. When dasher plate is pushed down a small amount of liquid dispenses. Surplus liquid drains back into reservoir using brass plunger and pump assembly. 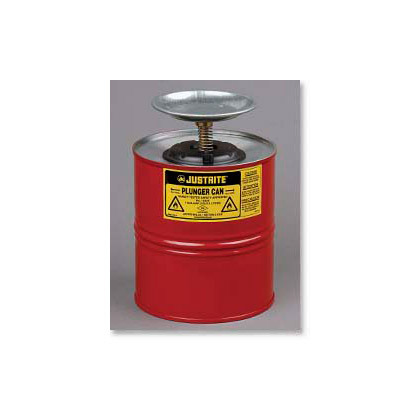 Jsutrite Safety Plunger Cans feature flame arrestor dasher screens. Top plate with rims has molded edge protectors for smooth moistening. FM approved. 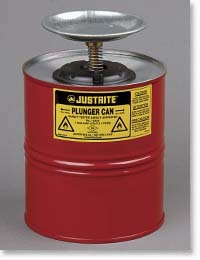 Steel Plunger Cans are made from 24 gauge steel with chemical resistant powder paint finish.